Peavy Cirrus 4 String Bass With LED Fret Markers. Condition is good used condition. The LED board was professionally done. Includes hard shell case, that has some stickers in it. 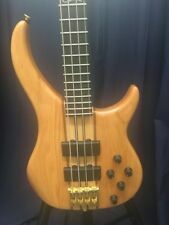 Up for sale is a Peavey Citrus custom 4 string bass, very low action. Active electronics, nice gig bag, like new. Cirrus logo at 12th fret. Adjustable @ Bridge. String Spacing. Neck Radius Neck Material Maple neck through w/mahogany sringers. FREE HERCULES GS414B STAND. Scale Length. Peavey Cirrus 5 Walnut 5-String Bass. Electronics, and a neck-through body have made this one of the most sought-after basses in the world. Gold hardware, milled ABM multi-adjustable bridge, ebony fretboard, graphite-reinforced neck. Graphite-reinforced neck with dual expanding truss rod. This 35" scale maple neck-thru bass with mahogany stringers features a Rosewood or Pau Ferro fingerboard with 24 frets and a two way, fully adjustable torsion rod. The Cirrus includes string-thru ferrules, 19:1 ratio Gotoh tuning machines, and a milled brass bridge giving players a choice of top loading the strings or stringing through the body. Adjustable string spacing. Case included. Active preamp. Maple neck with mahogany stringers. 20:1 ratio Gotoh GB720 tuning machines. Milled brass bridge. 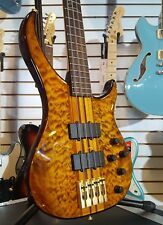 Peavey Cirrus 4 4-string Electric Bass - Tiger Eye w/ Case, New! Peavey Cirrus 4 Tiger Eye. 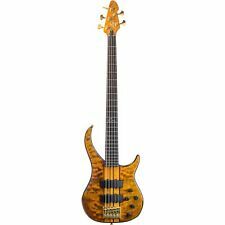 Peavey Cirrus 4 Tiger Eye 4-string Electric Bass. 4-string Electric Bass w/ Case. Adjustable string spacing. Our goal is to process your orders quickly, efficiently and professionally. Empty Sub Boxes. - Bass Blockers. - Battery isolator. - Bass Guitars. Adjustable string spacing. Subwoofer Exception : Our warranty does not cover blown voice coils, or subwoofers that have been punctured. Peavey Cirrus 6 6-String Bass. Previously owned Peavey Cirrus 6-String Bass in Walnut Finish with Rosewood Fingerboard. This bass is in very good overall condition. This bass weighs 9lbs, 10oz. Serial #: 10423048. Plays so smooth its like playing butter! Maple neck with mahogany stringers. Rosewood fingerboard. Adjustable string spacing. Case included. Milled brass bridge. Satin gold hardware. In EXCELENT condition with gig bag. It's a great Bass and it sounds fantastic. Adjustable string spacing. Case included. Milled brass bridge. up for your consideration is a Peavy Cirrus, flame maple top with matching headstock, in good condition, comes in nun original HSC. B Poor (May Need Repair). C Bad (Need Repair). (original). Active preamp. • This item is new on display. (So, it can be very expensive compared to the price in your country.). - The price is set depending on the market price in Japan. • This item is new on display. • Scale length: 889mm. (So, it can be very expensive compared to the price in your country.). - The price is set depending on the market price in Japan. Another one of my prized collection and a very rare "bird" up for sale. Have only seen 1 on sale the past 2 years. Sounds fantastic as all Cirrus USA basses do. Top : Claro Walnut. • Material: Alder, Mahogany, Maple, Rosewood. Body: Red Oak / Alder. • [Fingerboard] Rosewood. Maple neck with mahogany stringers. Fingerboard: Rosewood fingerboard. • This item is new on display. (original).